In his heyday as a global movie star, Arnold Schwarzenegger usually played characters with super generic Anglo names—a Gallic shrug on the matter of onscreen credibility, since it was a given that he could only ever look and sound exactly like an Austrian-born former bodybuilder. Even in Kindergarten Cop, which for whatever reason is the only movie in which he plays an Austrian immigrant, his character’s name is John Kimble. So it’s a surprise to see the former action star, now almost 70, appear credible in a role, as he does in the tiresome Aftermath, playing a blue-collar Ukrainian immigrant named Roman Melnyk. He looks like so many barrel-chested Eastern Europeans found in the cities of America: the baggy leather coat, the leather phone holster on the belt, the tucked-in shirt faded by overwashing. And he is something close to believable. If you live in an old immigrant neighborhood, this man might be your landlord or your uncle or the man you call when the heater needs to be fixed. Perhaps in different hands, this might be important to understanding his character. The script, written by Javier Gullón (Enemy), was loosely inspired by the 2002 air disaster that took place outside of Überlingen, Germany, in which a passenger plane from Moscow collided with a cargo plane in midair, killing all aboard—or, more accurately, by its sensationalized coda. About two years after being cleared of responsibility, the Swiss air traffic controller who had been in contact with both planes was stabbed to death at his home by a Russian man who had lost his wife and children in the crash. 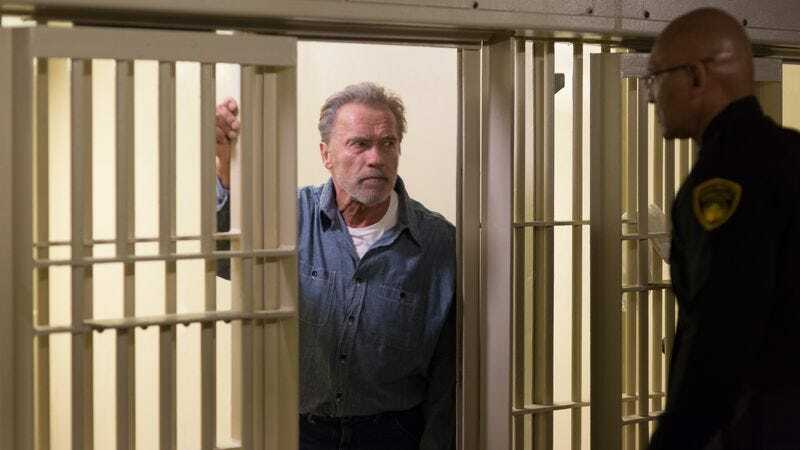 This review could play coy with the fact that Aftermath is based on a very public murder (which later resulted in a few diplomatic incidents), but look—the only still of Schwarzenegger provided by the distributor features him in a prison cell. Inevitability creates its own brand of suspense, and there is a hard-to-miss parallel between the fateful intersection of two flight paths and the climactic meeting between Roman and Jake Bonaos (Scoot McNairy), the air traffic controller and middle-class family man who was alone in the control tower the night of the collision. The question, then, is what between these two points. The answer is not much. Director Elliott Lester takes a one-note-fits-all approach to trauma and guilt, too ponderous for either the grotesquerie of the air disaster (Roman finds his daughter’s body dangling from a tree at the crash site, as did his real-life counterpart) or the obsession of revenge, to the point that the climactic act makes little psychological sense. Lester stumbles on one memorable idea by staging the collision as a control tower one-man show, which recalls his made-for-HBO film Nightingale. However, Aftermath largely lacks that crucial immediacy. The real event remains politicized, but despite the differing implications of moving the story from several European locales to the suburbs of Ohio, the movie shows little interest in either dramatic context or the realities of human behavior. Jake and Roman become interchangeable as they go through appointed stages of cinematic grief: the slow-motion shot, the dialogue that drops out, the boardroom conversation with the gel-haired suits who only care about the money, the averted suicide attempt. (Add this one to the inevitable supercut of movies that obviously used the “Time” cue from Hans Zimmer’s Inception score as a temp track for an epilogue scene.) In real life, not even funerals are this exhaustingly joyless. 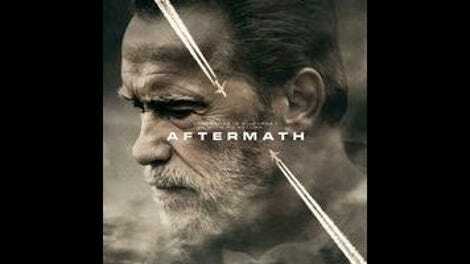 In fact, Aftermath only becomes interesting if considered as a dour subversion of the daughter-and-wife revenge scenarios of Schwarzenegger’s action movies—as star text, in other words. That requires the viewer to check out emotionally. Fortunately, the movie offers plenty of opportunities to do so.